Institute for Biological Problems of Cryolithozone of Siberian Branch of Russian Academy of Sciences, IPBC SB RAS, Russia. “Elgeeii” scientific forest station of Institute for biological problems of cryolithozone of Siberian branch of Russian academy of sciences (Russian Federation). The “Elgeeii” scientific forest station (60°01′01″N 133°49′53″E; elevation approx. 202 m asl. ; study area 1.5 ha) is located on a ancient terrace on the left bank of the middle reaches of the Aldan River in South-Eastern region (Ust-Mayskiy Ulus) of the Republic of Sakha (Yakutia), Russian Federation, in a continuous permafrostPermafrost is frozen ground that remains at or below zero degrees Celsius (32 degrees Fahrenheit) for two or more years. It forms in regions where the mean annual temperature is... More region (permafrost thickness over 120 m), approximately 65 km south of Ust-Maya settlement and 730 km south of Arctic CircleA line of latitude currently at 66° 33′ 44″ (66.5622°) north of the Equator. It is the southern limit of the region of the Earth that experiences the 'midnight sun'.... More. The main ecosystemAll the living organisms (including people) in an area as well as its physical environment, functioning together as a unit. An ecosystem is made up of plants, animals, microorganisms, soil,... More near the station is borealNorthern, from Boreas, the Greek god of the north wind.... More light taigaBoreal forest, a nearly continuous belt of coniferous trees across North America and Eurasia. Taiga is dense forest with many fallen trees and marshy soil. The term derives form the southern Siberian Turkic-Mongol... More, with pine and birch forests together with permafrost lakes, meadows and mixed forests. Main forest types are red-bilberry larch forests, cowberry pine forests and herby birch forests. The main big animals are red fox, wolf, brown bear, moose, red deer, reindeer. 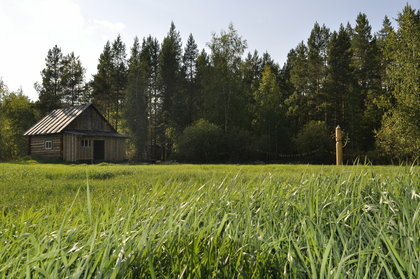 Scientific forest station “Elgeeii” was founded in 2009 by Institute for Biological Problems of Cryolithozone (Siberian Branch of Russian Academy of Sciences) together with RIHN scientific project (Japan). The station has 2 buildings with ca. 20 beds and accommodation (microbus car, meals, water supply, kitchen, sauna, summer-time shower, autonomous heating, satellite phone). Outdoor storehouse and workshop are available, equipped with some basic instruments. Summer-time accommodation for 20-25 peoples is available. There is 34-meters height observational tower in Larch forest with big range of micrometeorological devices, equipment and eddy-covariance system. Solar power supply (12/24 VDC, ~500W) and diesel generator (220 VAC, 4.5 KW) are available. The main aim is the understanding of interaction between the atmosphere, the biosphere, the hydrosphere, and the cryolithosphere with the main focus to global environmental change. Nearest settlements are Petropavlovsk and Ust-Maya (around 60-65 km to the North) with various shops and facilities, there is well-equipped hospital. The main livelihoods are hunting and lumbering. Scientific forest station “Elgeeii” is reached first by airplane to Ust-Maya airport (around 1 hour flight from Yakutsk city) and then by motor boat (about 1.5 hours) and then by car (15 min drive) or on foot (1 hour walk).